The PC was spared much of the loud and reverb-dominated days of Activision’s Hero series, but in 2010 there were plans to bring it to our platform in the form of a Guitar Hero MMO. If you find that a nightmarish vision of franchises gone wrong, then you’ll be pleased to know the massive music game crash – where everyone suddenly decided they didn’t like plastic guitars anymore – safely drove a stake into the MMO’s heart. Need a game that isn’t dead and buried? Try one of the best MMORPGs. Revealed in an episode of Unseen 64, DJ Hero developer Freestyle Games were looking for a new direction for the Hero series. The idea was a combination of practically everything that was popular seven years ago: MMOs, music games, and Facebook. Activision were keen on the idea, but Freestyle were inexperienced in any of the required design areas. The project was assigned to Virtual Fairground, a mostly unknown studio who had developed their own engine and server system for a previous game that shared similarities with the Guitar Hero MMO vision. And so Hero World was born. The game was to be a browser-based management sim where players set up their own clubs and attempted to attract NPC punters. Clubs could be decorated Sims-style, and rivals could be challenged to turn-based dance off duels in order to gain territory. The biggest element of Hero World was to join all elements of the Hero franchise together. As a club manager in Hero World you would be able to recruit Guitar Hero or DJ Hero players to hold gigs at your venue, attracting more visitors for the club and paying out big in-game money to the players of the console games. A Facebook game would have linked into Hero World, offering a more simple take on the system. 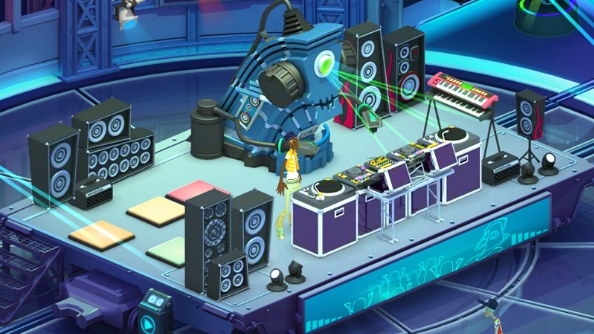 Virtual Fairground worked on Hero World for several months, but the project was eventually cancelled by Activision as it became clear that the popularity of music rhythm games was severely declining. Unfortunately this was bad news for Virtual Fairground, who failed to find a buyer of a re-purposed version of the game, and thus eventually went bankrupt. Had Activision not flooded the world with endless installments and spin-offs of Guitar Hero, would this unifying MMO have interested you?